When you’re new to larp (or starting a new larp) getting started could be expensive in both time and money. There are so many fancy armors, and latex weapons out there. Purchasing them is so tempting. 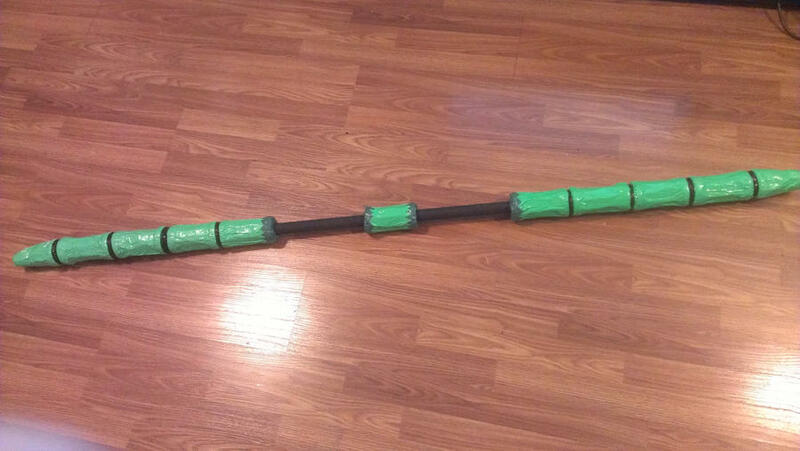 But while DIY boffer weapon construction does take time, it doesn’t have to be expensive. Making your weapons yourself is also a lot more rewarding. With these guidelines, some practice, and by following 10 steps you can be making low cost boffer weapons. First a word about foam. Unfortunately there is only one foam product ready made for boffer construction. Fortunately it’s cheap. You want Frost King brand foam pipe insulation. Where people run into trouble is they purchase foam which has thin walls. All weapons will have at least 5/8 of an inch thickness of blade foam. To think of it another way there should be 5/8ths of an inch of foam between you and the PVC core of the weapon. Frost King brand is the last surviving brand of foam insulation to provide that thickness. When ordering or purchasing the foam make sure it says “4 Pack 3 ft. Black Tubular Polyethylene Foam Pipe Insulation, Pre-Slit, Heavy Duty 5/8 in. Wall Thickness, For Use On 3/4 in. Copper Pipe Or 1/2 in. Iron Pipe.” The nearest retail supplier (that I know of) is the County Stores True Value Hardware in Milford NH. You could also try purchasing online from a reputable seller (I have not purchased anything from this store, they have a positive review rating over 1,000 on google shopping). Second most people think that boffer swords are made with PVC, Foam and Duct tape, because that’s what you can see. The weapon is really made with PVC, Foam and Strapping Tape. The duct tape is just a pretty cover. All pvc must be ‘capped and strapped’. Meaning that the ends must be covered with a material that will prevent the pvc from puncturing skin, should the foam fail. In the 90’s this was usually accomplished with a nickle. Today it’s much more effective, versatile and lighter to cut a nickle sized portion of plastic soda bottle (the flat plastic from a 2 liter bottle), and trim it to size with scissors. The soda bottle cap makes a good cap for the pommel. Cut the threads out of the inside of the cap before attaching it with strapping tape to the pvc. 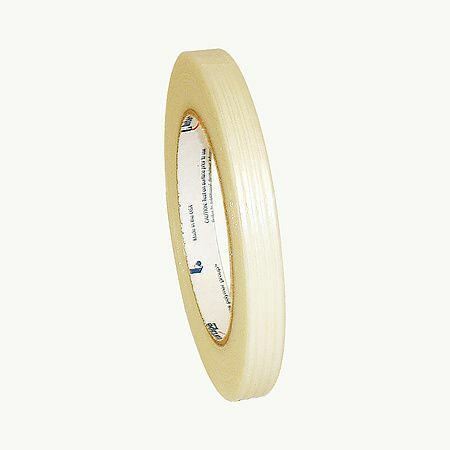 The ‘Strapped’ part means that there must be strapping tape running the length of the blade. This prevents shards of PVC from flying around, should the weapon break. This is extra important for all fiberglass weapons, as we do not want fiberglass splinters anywhere. The splinters are a health and environmental hazard. There are two kinds of ends needed for safe boffer weapon construction: Safety Tips and Squishy tips. Weapons designed to stab must have both. If you build a weapon without a squishy tip it will be for slashing attacks only. Making thrusting attacks with a slashing weapon will result in either the weapon being removed from combat, or you being removed from combat. New players will use weapons which have both safety tips and squishy tips. Fighting styles evolve over time, experienced players should monitor their own style and switch weapons when needed. A Safety Tip is an portion of the blade of a weapon which has no PVC in it. It should be at least 2 inches long and filled with foam. It could be longer, but lengths longer than 2.5 to 3 inches are not recommended, as the end of the weapon can become bent. Safety Tips should be filled with pipe insulation. A Squishy Tip is an additional 2 inches of open cell foam at the thrusting end of the weapon. It should be attached firmly, but without compressing the foam. This provides an area of very light foam at the end of the weapon that compresses and returns to its original shape when thrusting. Duct tape should be applied as thinly and evenly as possible on the striking surface. Weapons can be counter weighted by adding any of the materials already listed to non striking surfaces. Rope or leather can be used to make the grip. Weapons will have to be re bladed frequently (perhaps once a year for infrequent use), so make sure to have spare blade foam around. Weapons over 6 feet in length need to be built with more care. Two handed boffer weapons constructed with PVC can become very flexible, and snap much more easily than shorter weapons. Generally fiberglass cores are much safer for longer weapons. I would recommend checking out Bandshoppe poles and Dagorhir spear construction for anything longer than 6 feet. The Death Que-Tip: Combining all the weapon restrictions, gaining no advantages. A note about Boffer Staves and ‘Death Que-tips’. Some players like to construct two handed weapons which resemble a staff. There is an effective way to do this, and an ineffective way. “Death Que-tip” is slang for an incredibly ineffective boffer weapon which has a handle in the middle and striking surfaces on each end. These weapons have all the weight and rules restrictions of a two handed weapon, and the combat effectiveness of a one handed sword. Generally they are bad idea, but new players tend to insist they will be great. Feel free to experiment with Staves and Death Que-tips. They are perfectly legal weapons… just not very effective weapons. How-To: Make a fighting quarterstaff (that won’t kill anyone) from Wired archives. A much more effective method of creating a similar weapon is to pad all of a piece of PVC and simply get used to holding something 2 inches in diameter. The obvious problem with this kind of weapon construction is tightly gripping the weapon will cause the striking surface to wear out quickly. As long as the player is diligent about reblading the weapon, it will be more effective than a ‘death que-tip’. 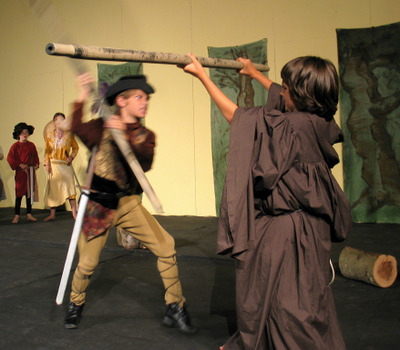 Throwing Weapons must be specifically constructed to be thrown. There can be no pvc or fiberglass in the throwing weapon. Latex throwing weapons (which could have fiberglass cores) are acceptable as long as they are also covered in foam. Never throw any weapon that has exposed pvc or exposed fiberglass. There should be no pointed edges to throwing weapons. Make sure all edges are sufficiently rounded. Boffer throwing weapons can be made easily out of the blades of old weapons. When you reblade an old weapon save the foam, remove it with as little damage as possible. Without a core inside it will make a great throwing weapon. There are bound to be things I’ve forgotten, or do instinctively which may not be obvious. You can ask me questions directly by tweeting @jspringfied211. You can comment, ask questions, and provide suggestions for this post on my Google Plus feed (it attracts less spam than my website). And finally you can find me on Ello.co as @larp.